Scandinavian Homes: Sveriges sydligaste passivhus? Vill tipsa om en tråd på forumet Bygga hus om Sveriges sydligaste passivhus. Det är vår standarmodell Hibernia 138 som kundanpassats för att passa in i miljön på Sveriges sydspets. Familjen är Svensk-Irländsk och de kände väl till Scandinavian Homes passivhus från Irland redan innan. Läs och kommentera! Gordon here from Smygehamn, a big thanks to all in Scandinavian Homes for the fantastic job you have done on our house pictured above. We finally moved in last weekend. If I had known how long it would take I would perhaps have not done quite so much of the work myself single-handed, but now that the job is (nearly) complete I am very very satisfied with the result. The house we moved from which was built in 1991 has already had the heating on for the past few weeks but after 3 days of constant 10m/s winds I am sitting here in our new house with an indoor temperature of 22C despite having no heating on at all! Early days yet but I look forward with confidence to very low heating bills for our new home, I will keep you updated. Warmest regards to all in Scandinavian Homes AB for so much assistance in making our new house build a smooth and enjoyable experience. A little update on how we are getting on in our new home. We continued through October and into the middle of November without any heating on in the house. Then around the middle of November I switched on the electric after heater in the ventilation system set to auto to maintain a minimum of 20ºC in the house. I also switched on the electric under floor heating in the bathroom upstairs to take the chill of the tiles in the morning and in the evening, this runs for 4 hours a day so draws a maximum of 1.6kWhrs of electricity. Since the beginning of December I have had an energy monitor on the supply to the ventilation unit so that I can measure how much electricity the heating element is consuming. Most days it has been around 5 kWhrs and the highest daily consumption so far has been 7 kWhrs when we had a minimum outdoor temperature of -10ºC overnight. All the time maintaining a minimum of 20ºC indoors. I have yet to insulate the pipework around our hot water cylinder so that is also contributing some more heat to the house but I would estimate that on average we are adding less than 10kWhrs of heat to the house per day when our PHPP estimated a requirement of around 30kWHrs/day at this time of year. Given that our house faces south east and so is not optimal for solar gain it really amazes me how a few hours of morning sunshine can raise the indoor temperature by 2ºC at this time of year. The ventilation system itself is also a great success, the indoor environment is always pleasant, with real "fresh air", the bedrooms in particular are never stuffy in the mornings. So as you see we are very satisfied with the performance of the house so far and whilst I fully expect the heating requirements to rise as we get into the really cold months of January and February I am now optimistic that it will be well below the PHPP estimates and the "real world" performance of the house should be well below the estimated parameters of a certified passive house. Great to hear that your Hibernia works well. Looking at the our modular list I see that a Hibernia 138 with upstairs has a true floor area of 225m2 in passive version. That should mean that there needs to be 4.5 persons living in the house according to PHPP. Have you 2.5 children for passive gains? Our old passive Hibernia 164 (235m2 floor area) in Galway (that we use as an office) does not keep over 20 degrees from November onwards because we do not have the passive gains from any inhabitants. This year we introduced three thermostatically controlled 200W electric micro heaters to simulate the prescribed 5.5 inhabitants for passive gains. This way we maintain the 22 degrees that we require in our office, and we have not yet needed to put on any (other) heat this winter. 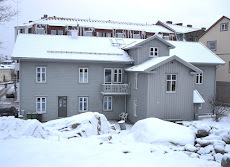 Our new passive apartments in Lysekil seem to perform as well as your house. It is a Skagerak 304 with 304m2 floor area. I was visiting the tenants in late November. In the large apartment in the middle there was 22 degrees, perfect humidity and a very happy family. Then I visited upstairs. These apartments are etage-type with two bedrooms and a bathroom under the roof with a Velux window in the bathroom. Here I heard that the temperature had been down to 17 degrees. Quite worrying since the supply air of the heat recovery-ventilation system is equipped with a water-coil heated by the solar tank in the basement / alternatively topped up by district heating. It should be warm in spite of -5 every night for a few weeks. I checked the circulation pump in the basement, it is a very small EC Eco pump and it was set to lowest speed. So low that practically no water was flowing through at all. Simple fix, increase the speed of the pump one step and; Abra Kadabra, it became warm and nice in the two top apartments too. Dr Shane Colclough, our head of research in the EU research programme EINSTEIN is monitoring both buildings since last summer, so we will find out exactly how correct our passive performance claims are. Thanks for your great postings. I see that you have more than 15.000 views at Bygga hus now. Your house and your work is of great interest for many, keep up the good work Gordon!